Those awaiting the complete list of room assignment for September 27, 2015 (Sunday) Licensure Examination for Teachers (LET) also known as Teachers board exam can find here the designated testing center as the Professional Regulation Commission (PRC) posts assignment in just few weeks before the board exam. PRC and the Board for Professional Teachers (BPT) are set to conduct the second LET this year in the following testing centers: NCR (Manila), Baguio, Cagayan de Oro, Cebu, Davao, Iloilo, Palawan, Laoag, Legazpi, Lucena, Pagadian, Rosales, Tacloban, Zamboanga, Bacolod, Masbate City, Catarman, Jolo, Sulu, Palawan, Oriental Mindoro, and Hong Kong. On August 13, PRC announced Hong Kong in China as additional testing center for the September 2015 Board Licensure Examination for Professional Teachers (BLEPT). In July, Catarman, Northern Samar were added based on Resolution No. 2015-04, and Resolution No. 2015-11, series of 2015. Meanwhile, the inclusion of Oriental Mindoro, Palawan and Masbate City, Masbate in the list of testing centers is based on Resolution No.30, series of 2015. NOTE: The COMPLETE LIST of room assignment for September 2015 LET is available here. 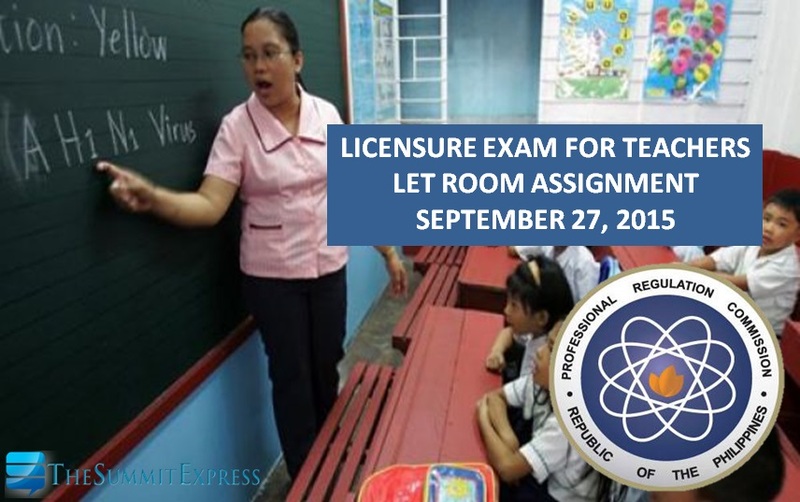 The Official Website of PRC will publish list of room assignment per testing center for September 2015 LET. It is expected that the commission will provide list within 2 weeks before the exam day. 1. Check and visit your school and room assignment a day before the examination to verify your room and seat number. 2. On the day of examination, report to the school/building assignment not later than 6:30 AM. Be punctual. Note that LATE EXAMINEES WILL NOT BE ADMITTED. Examination fee of absent examinees will be forfeited. Like Us on Facebook or follow-us on Twitter to receive updates related to Teacher's board exam. We will also update this site for the possible release date of September 2015 LET results. We also deliver news via RSS Feeds or E-Mail.